Starting a company while in the first year of your MBA at Harvard seems like putting enough work on your plate to make anyone go crazy. 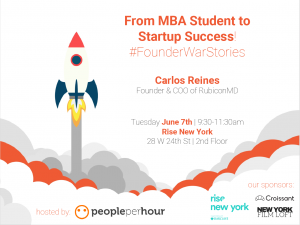 If you’re Carlos Reines, Co-Founder and COO of RubiconMD, it’s just part of the course - an opportunity came and he took it. Carlos met two important people during his first semester at HBS at an MIT Hack event, his Co-Founder and a very supportive mentor. Meet Carlos and Hear His Story! Many budding entrepreneurs struggle with knowing when to take the leap and jump into their side project full-time. So, how do you know when you (or your business) are ready? Whether your business is a service or a product, you can’t grow without customers. Depending on the type of business you have, it may be one large customer or several small customers that you’ll need to prove that your business is needed and that it’s sustainable. You should know where this threshold is for your business and as you’re approaching it start to craft your exit from your day job. Did you start your business while in school? Make preparations as you approach graduation, meet with investors, mentors, co-founders and be ready to devote all of the time you spent studying to your business. Prepare yourself for the reach you’ll have with all of that extra time to devote to your business. Is your business profitable? Does it have the potential to be profitable or can you get investors in a timeframe that you can survive financially? As you gear up to strike out on your own, be frugal (if you aren’t already) and save a portion of your paycheck each cycle, so that when you do leave your FT job, you have enough financial cushion to feel comfortable. Evaluate your monthly expenses and set a goal for yourself. In the meantime, keep building up your customers and potential customers so you start strong right out of the gate. Not everyone will agree with your decision to go out on your own, but don’t keep those people around. Make sure that you surround yourself with people who are supportive of you and your business. These people don’t need to agree with every decision you make, but you need to have people to turn to for advice when things get tough, a sounding board for new ideas, and sometimes just to lend an ear. Claim your spot today and join us June 7! Looking forward to this event.